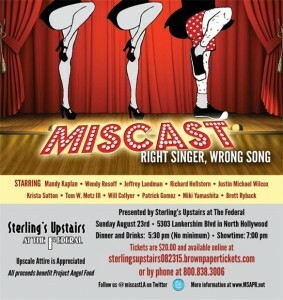 On Sunday, August 23rd I attended my first ever Miscast at Sterling’s Upstairs at the Federal. Mandy Kaplan has been putting together these shows for a couple of years—this was the 16th in the series. 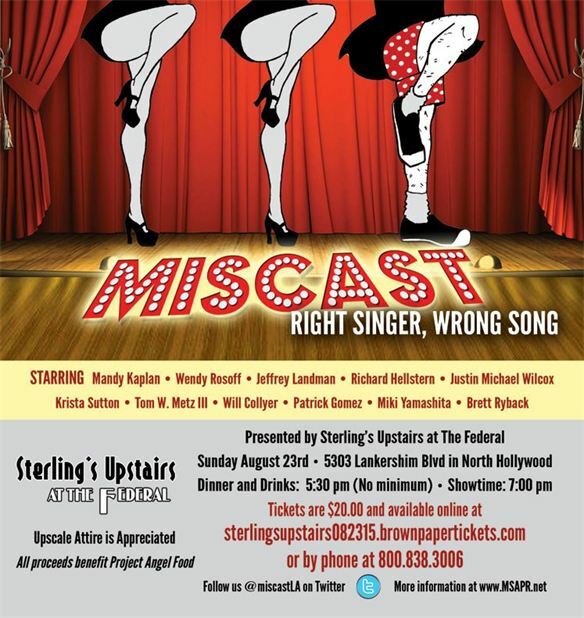 It’s a fun time for the singers—they get to perform Broadway show tunes they would never get a chance to sing otherwise because they are totally wrong for the show’s casting—as well as great fun for the audience to experience the sheer joy of the performers. An added bonus is the proceeds go to the benefit of Project Angel Food. Where else could you see white boy Tom W Metz III getting his groove on doing “Ain’t Too Proud to Beg” from Motown-The Musical? Or petite Asian Miki Yamashita singing the angry black man ode “Man Say” from Raisin? Kaplan got the show off to a rousing start with Jesus Christ Superstar’s “What’s the Buzz?,” taking the role of JC complete with fake beard. Will Collyer was her Mary Magdalene while Krista Sutton took the role of Judas and the rest of the cast played the chorus of apostles and handmaidens. Jeffrey Landman did a fine job with “It’s an Art,” the waitress’ lament from Working while Wendy Rosoff even included the soft shoe break in “All I Need is the Girl,” Tulsa’s solo from Gypsy. Justin Michael Wilcox decided to do a stripped down version of “Cabaret,” to let the lyrics breathe, but he soon got caught up in the sheer theatricality of the song and ended up doing a high stepping homage to Liza. Richard Hellstern had a manic time finding his inner Sea Witch with Ursula’s “Poor Unfortunate Souls” from The Little Mermaid and Patrick Gomez’s utter joy of singing Footloose’s “Let’s Hear it for the Boy” to his ringside boyfriend was totally infectious. Evidently Kaplan has a particular fondness for the score from Miss Saigon, having previously performed numbers by the characters of Kim and Chris. 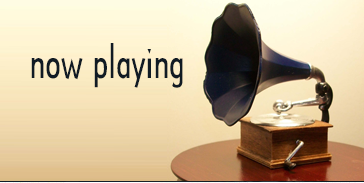 For this outing she mainly assayed the role of Thuy while performing “Trio” as a solo. Sutton had a similar obsession with performing Carousel’s “Soliloquy” which was split in two because it’s very, very long. For the finale, Will Collyer did his very best Miriam Makeba tribute by belting out The Lion King’s “Circle of Life” while the rest of the cast took on the roles of the various animals which culminated in young Simba (Yamashita) being raised on high. The audience was on high with a heartfelt and immediate standing ovation. Brett Ryback provided stellar accompaniment on piano throughout.